APPARENTLY looking at the education policy, it seems stakeholders’ clamour for a review is paying off as Lagos State Government is reviewing its 30-year-old policy on education. The state’s policy on education was last reviewed in 1988 under the military administration of Navy Captain Mike Okhai Akhigbe. In line with global best practices, the Lagos State Government recently invited students, teachers, parents, headteachers, staff of basic, secondary and higher education institutions, administrators, private sector, media houses and other stakeholdres to take a final look at the revised draft policy with a view to validating and taking collective ownership of the revised policy. Professor Peter Okebukola who spoke in Lagos during the Stakeholders’ Engagement Forum on the Review of Lagos State Policy on Education said that having gone through the review policy, the roles of every stakeholder were clearly specified in the policy, adding that there were no overlaps and ambiguity. According to him, there is high internal consistency in the document and synergy, stressing that it could serve as a model for other states and even a template for the Federal Government at the next revision of the National Policy on Education. Having been impressed by the reviewed policy, Okebukola who is president of UNESCO in Africa said he was looking forward to a formal launch of the policy, and promised to share the document within UNESCO global community. He said: “When I received the first draft of the Policy in December last year, I subjected it to intensive scrutiny and analysis. In my view, Lagos State should not just have a policy on Education for show, but being a centre of excellence, its policy on education should reflect excellence. After reviewing the policy with what we have in the top three educational systems in the world – Finland, South Korea and Singapore, the Lagos State Policy on Education is no pushover. “Let me put the educational policy of Finland side by side that of the Lagos State Education Policy. The Finnish policy aims at providing equal opportunities for all citizens to high-quality education and training. The Lagos State Education Policy does the same. The key words in Finland education policy are quality, efficiency, equity and internationalisation. The policy is built on the principles of life-long learning and free education. Education is seen as a key to competitiveness and wellbeing of the society. The Lagos State Education Policy shares the same attributes. While highlighting some distinguishing features in the policy, he maintained that the reviewed policy was both contemporary and futuristic in orientation, noting that it has provisions for contemporary issues as well as future directions of education in Lagos State. The UNESCO president in Africa who noted that the policy was comprehensive and detailed, disclosed that the policy covers all the angles relating to input, process, output and outcomes. It is well aligned with the National Policy on Education in terms of structure and framework. Meanwhile, the Deputy Governor of Lagos State, Dr. Idiat Adebule, in her keynote address, commended stakeholders for availing the government of their different opinions on the policy review, stressing that the process of the review started with Needs Analysis, which included issues that triggered the review as well as policy gaps. According to her, the second step was the policy contact, which she discribed as an outreach to the experts and known stakeholders by the ministry. She identified the third stage as the research and drafting process where the State Government engaged experts in the field at a three-day retreat between December 14 and 16, 2017. The stakeholders’ consultation is the fourth level of the engagement for review and update of the 30-year Education Policy, she explained. In the stakeholders’ reactions, one of the participants, Dr. Wasiu Gabadin said the implementation of the policy was the key issue. He lamented that the country has good policies, but that the issue rested with implemenation of those policies. 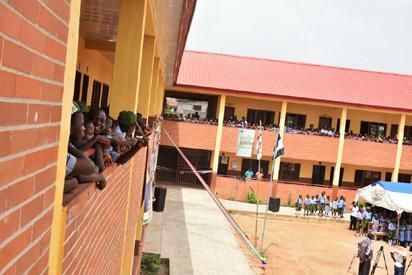 On his part, Femi Ogunkoya, who represented private school owners said the state government should issue primary school leaving certificates to pupils to ensure that underage pupils do not gain admission into JSI. Permanent Secretary, Lagos State Ministry of Education, Mrs. Adebunmi Adekanye, in her welcome address explained the importance of the meeting, adding that it was to enable a robust review of the document to ensure the emergence of an enduring policy. She promised that the document will still go through a second stage of drafting where all contributions from the consultative forum and other inputs that might come in form of written documents, will be considered. The permanent secretary opined that the document was still open to suggestions, adding that though the draft could not be released to everyone, experts and stakeholders were at liberty to make further contributions based on their experience on the field. The post Education Policy Review: Lagos shares attributes with Finland — OKEBUKOLA appeared first on Vanguard News.